But we had so much snow this winter! But it’s only a couple degrees! But the temperature in my hometown feels fine! We’ve heard it all from climate change deniers. This elegant visualization sets the record straight. The data supporting climate change is undeniable; we live in a hot world that’s getting hotter. And yet, even though that change is easy to document, it’s sometimes hard to get people to really see the overall climate trend when they’re thinking mostly about the weather they are personally experiencing. That’s why this mesmerizing new graph from climate scientist Ed Hawkins of the National Centre for Atmospheric Science at the University of Reading gives such an excellent overview of what’s really going on. 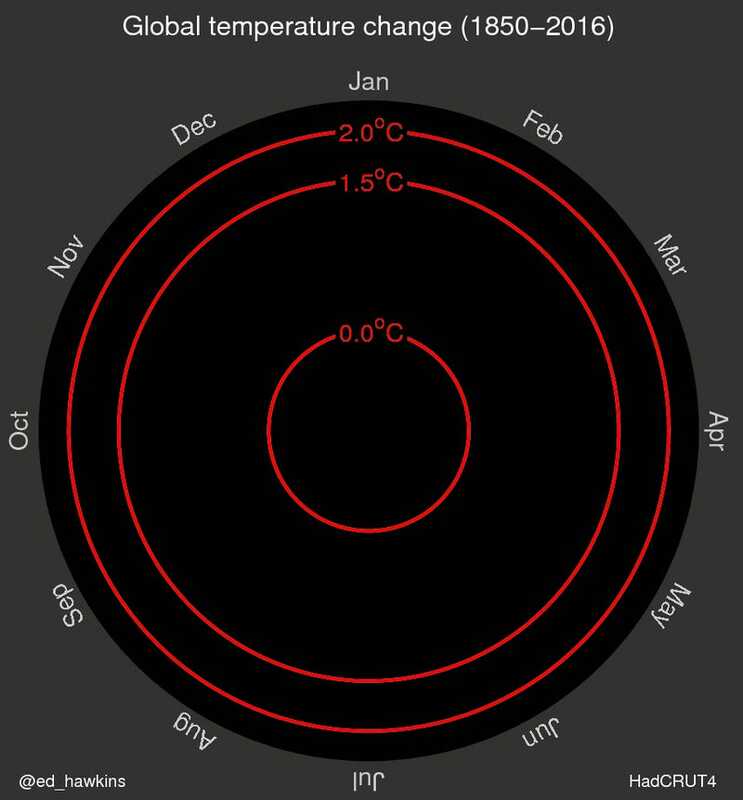 In the graph, Hawkins charts out every month’s temperature change since the 1850s into an outward expanding spirograph of climate data. Hawkins was also one of the contributing authors to the IPCC’s 5th climate assessment, which was full of plenty of alarming climate graphics and predictions of its own. This new presentation of that same climate data, though, lets the noise of tiny variations fade into the background while still showcasing, very simply, the undeniable trend.